Arlington, TX, USA (JULY 2, 2014) / PR Newswire / — Six Flags Over Texas, the Thrill Capital of Texas, is raising the intensity on one of the most innovative and adrenaline-charged roller coasters in the industry. BATMAN The Ride will be more intense beginning July 4 when it takes riders on an all new experience—backwards! “No matter how many times you have been on BATMAN The Ride, nothing compares to the thrill of racing down ten stories facing the other direction,” said Steve Martindale, Six Flags Over Texas park president. As the coaster climbs the nearly 110-foot lift hill, riders will take in the full scope of BATMAN The Ride’s steel footprint as they anticipate the adventure that lies ahead. The train will reach speeds of 50 mph and travel through 2,700 feet of track, all while maneuvering hairpin turns, vertical loops, corkscrews and a zero-g roll. The excitement is magnified since guests cannot see the maneuvers that await them. 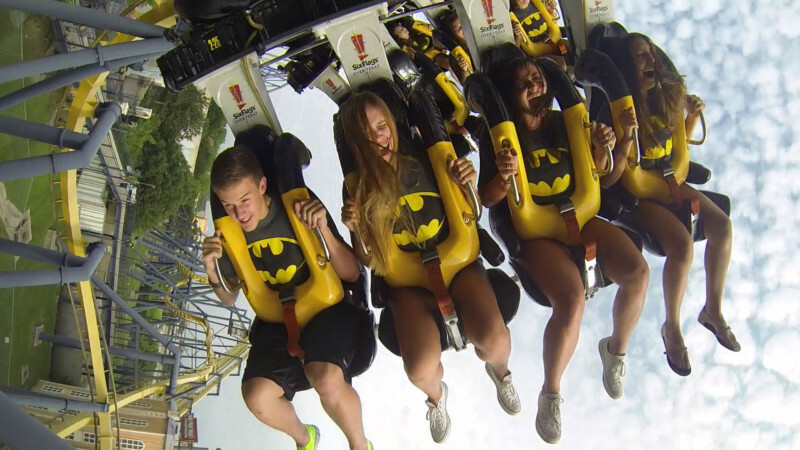 Celebrating its 15th anniversary, BATMAN The Ride has given more than 17 million rides and reigns as one of the most popular roller coasters at Six Flags Over Texas. BATMAN The Ride backwards will run for a limited time this season. PHOTO courtesy Six Flags Over Texas.